Low-Entry Palletizer – Möllers North America, Inc.
One of the unique challenges of bulk material handling is that goods must be moved in massive quantities. Often, these materials are very heavy and they require mechanical assistance to be moved around, stored, and shipped. 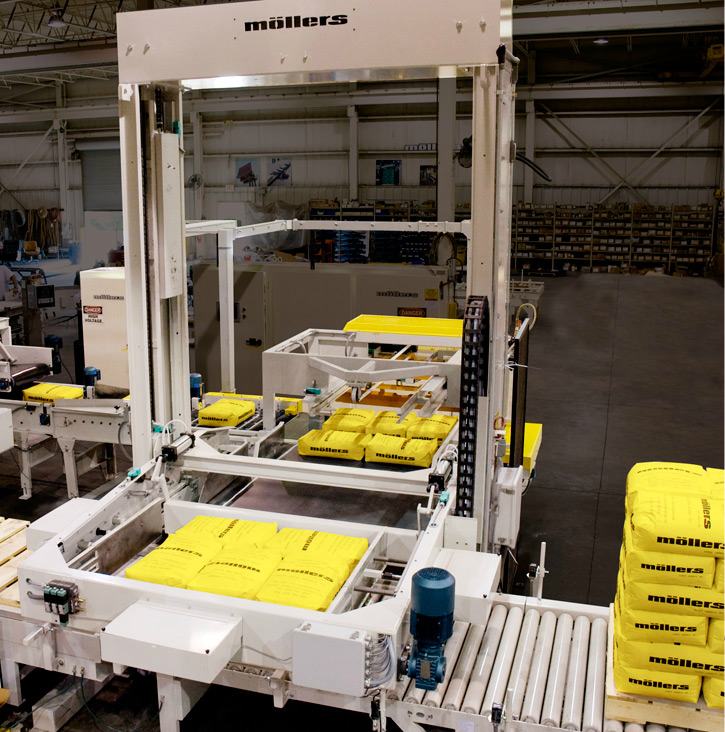 To reduce manual labor and increase efficiency, bulk material handlers use palletizers. A palletizer is a machine that can load and unload pallets before and after shipping or storage. Since pallets are a standard means of storing and transporting bulk products in many industries, a palletizer is a versatile solution. High-Level Palletizer – Columbia Machine, Inc. If a bulk product is being bagged, the bag is usually filled by a machine that holds the bag as material is discharged into it. The palletizer may be underneath or beside this machine, and it is ready to accept the loaded bag on an empty pallet. 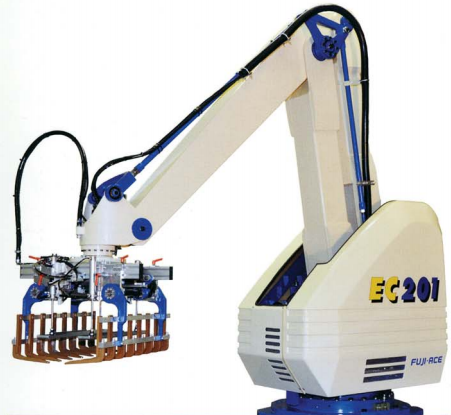 Manufacturers of palletizing equipment make three different types of palletizers: low-level, high-level, and robotic. A low-level palletizer accepts packaged bulk goods at the ground level and moves them along a conveyor. A high-level palletizer is loaded from above. Usually, both of these types are fully automatic so that no manual intervention is necessary. 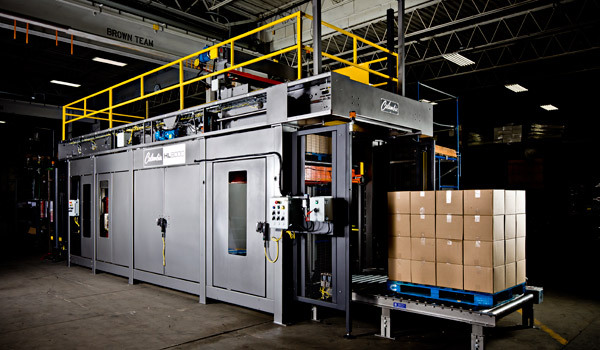 Robotic Palletizer – American-Newlong, Inc.
A robotic palletizer is typically placed between a conveyor with incoming materials and a dispenser. The unit can actually pick up these materials and place them on a pallet before dispensing the pallet to another area. A robotic palletizer can be programmed to work with many different types of bulk products and has a high weight capacity. Adding a palletizer into a bulk material handling facility helps to further automate the system’s process and reduce the risk of injury or lost material during transfer. Palletizers are faster than manual labor, and there is less chance of human error causing an accident while materials are being loaded if a machine is used. Overall productivity, safety, and efficiency all benefit when a palletizer is installed. To improve safety and minimize the chance of damage to the equipment, many palletizing units have QuickSTOP collision sensors. These sensors detect any damage to the equipment and shut it down immediately before further damage occurs. Smartscan systems can also be added to palletizers to detect human movement near the equipment. If someone gets too close, the machine will automatically shut off. While palletizers are powered by an electric motor, some heavy duty ones may uses hydraulics to raise and lower loaded pallets. Bulk material handling systems in almost every industry use pallets to transport their goods after they have been processed, so palletizers are a common piece of equipment. Industries like agriculture, food processing, pharmaceuticals, and chemical engineering all make use of palletizers to load products in a container or bag onto a pallet before shipping. Palletizers come in a range of types and sizes, so the cost varies. However, the upfront cost of a palletizing unit is usually significant, but returns can quickly be seen as the volume of bulk material processed increases. Most bulk material handling facilities easily recoup the investment that they make in a palletizing unit. Bagging & Palletizing To reduce manual labor and increase efficiency, bulk material handlers use palletizers. A palletizer is a machine that can load and unload pallets before and after shipping or storage. Since pallets are a standard means of storing and transporting bulk products in many industries, a palletizer is a versatile solution.